This past week has been filled with...well, let's just say it's been full. Nothing major here on the homefront, but since Tuesday everyone has been tense. Wednesday provided even more tension, and it continues. I am not a horribly political person. Don't get me wrong - I care. I vote. However, I have never been one of these who watches with bated breath any speeches, addresses, or takes a proactive role as a citizen, other than voting. I will voice my opinion when asked, but usually keep it to myself, as I have friends of all leanings and I like to keep it that way. The thing that shocks me the most is the complete shock of everyone. No one has ever seen the underdog take the lead? Isn't that where most great stories get their plot? I am not comparing Donald Trump to a superhero, make no mistake. However, this should teach everyone a lesson about the media that we all say, but few really believe. You can't believe everything you hear. Did we all forget that lesson? I guess we did. Something that bothers me is how much people are bemoaning this whole situation. I see so many people on social media lamenting the choice that was made. More than that though, I see people fearmongering the whole thing. As if in 4 years under one man's leadership will turn the clock back 200 years and start slavery again, take the vote away from women, and stop people from expressing themselves. That is a bit extreme. Do we want unjust, devisive attitudes to end? Of course we do - but that includes the devisive unjust attitude that he will be a poor leader. Do we want to quell the freedoms that we have so richly enjoyed to end? Of course not - but that includes allowing everyone to express their opinions as we express ours. I just got through with a discussion on Facebook with a friend about racism and people expressing it. His point was that racism is wrong, and cannot and should not be trivialized, as if it were no more than a flavor of ice cream. I agree with him. Racism is wrong on multiple levels. However, my point was that the freedom of speech that is in the Constitution and has been defended throughout our nation's history includes those who would express such sentiments. Unless it encroaches on another's rights, or endangers them, then those who are narrow-minded and unjust have the right to say it and make known their idiocy. I wholeheartedly agree that you should treat others as you wish to be treated, and that if you can't say something nice, don't say anything at all (which is the main reason I keep my mouth shut a lot of times). However, not everyone follows these rules all the time. Do you? I know I don't, despite my best efforts. Sometimes I get angry and say something I shouldn't. Sometimes I don't put myself in someone else's shoes and I do something I shouldn't. That's being human. But those people who say inherently mean things to others still have that right. They do not have the right to harm them, or harass them, but they do have the right to hold an opinion and express it, and should be able to do so without fear of some police force breaking in and putting them in jail. To do so then inhibits all our freedom of speech. Once you start with "no racism" speech, then it becomes "no sexism", "no ageist", "no anti-anything" speech. It is a slippery slope once you start down that road. I am still not defending the attitude or the actions that usually accompany it, but I am defending the right of everyone to be able to speak their mind, as we all do, whether anyone else agrees with us or not. And you know what? Silencing them isn't going to stop their attitude. All that does is breed hate and resentment, knowing they cannot express their feelings. This is how shocking things happen, like Columbine. Instead, we should have a dialogue. Don't rail against those negative attitudes - instead, ask why. Why does that person feel that way? What caused them to think that about a group of people? Sometimes what people really want is some attention and some understanding. I'm not advocating a "touchy-feely, everything is permissible" environment, but I do think sometimes just as a small child will pitch a fit in a store, sometimes we get so busy we ignore people and signs of cries for help. On Facebook, it's called "trolling" - when you say something to get a rise out of someone and see who will take the bait. In my day (man, that makes me sound old), it was called "being stupid" and usually got you punished by your parents (in my case, that was a spanking). But now we are surrounded by so many things reaching for our attention, we don't focus on the people around us, but the technology. And at the end of the day, everyone just really wants a bit of attention from someone else (I have seen a lot of behavioral issues in children dissapate when someone pays them more attention and makes them feel important - I think adults would respond *mostly* the same way). As for the election, we all can agree that the system doesn't work the way we'd like. Pitting "us" against "them" isn't going to solve any problem. Realizing that is the biggest solution. Was either candidate perfect? Not hardly. Personally, watching the campaign trails was like watching a farcical satire of our political system. I thought only a playwright could create such caricatures of people - but it looks like we as a nation can create them as well. Let me just say - I did vote, but I did not vote for either major candidate. Therefore, I have nothing in this fight. The Yarn Harlot wrote a post here about this and I think she is right - realize that just because someone voted for one candidate or the other doesn't mean they agree with everything the candidate said. Maybe it was one issue that a person voted their conscience on and couldn't imagine voting a different way. Maybe someone voted simply in hopes that history would be made (it was, no matter which direction you voted - unless you voted for a third party). Maybe it was along party lines (there are still those who will only vote for a certain party, unless the candidate isn't viable to them, in which case they don't vote at all - I know of at least one person like this). The point is that instead of blaming or bemoaning the way things turned out, make your world a better place and not wait on the POTUS or the government to do it for you. Reach out to someone in need. Show love and mercy to all you meet. Treat others the way you want to be treated. Stop blaming and screaming bloody murder, and speak kind words. And if you can't think of any, then just don't say anything at all. On the knitting front, I have almost completed one Christmas gift. The pictures weren't great, as they were inside. It's getting chilly these days! I love it. The cable needs to be stretched out a bit on these, but I like it. 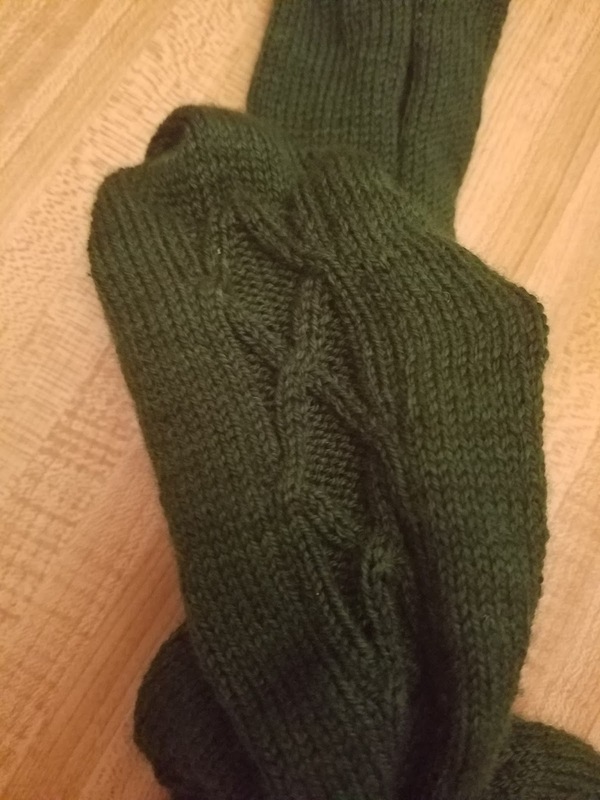 The yarn is English Ivy by Sweet Georgia Yarns, in Tough Love Sock and the pattern is based on Sea Wall from the Cascadia book by Tin Can Knits. Once I am done with this pair, I have 2 more pair to knit up and a vest to make. I may make a 3rd pair of socks, but we'll see how timing goes. 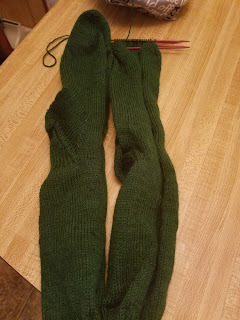 I hope to get each of the other 2 pairs done in a week each (super fast knitting!) and the vest I hope will get done this weekend, or shortly thereafter. I was hoping to get some sweaters done for the kiddos, but I don't know if I will have time to get them done as well. If not, the sweaters will follow just after Christmas for them. It is already getting cooler and we may be in for a colder winter. Have you made enough to bundle up in, or are you still working on your woolies?